Here's what I've been working on lately! On Monday, Jan. 21, 2013, at Arisia (New England's largest and most diverse science fiction and fantasy convention), Crossed Genres Publications of Somerville, Mass., will release Menial, an anthology of seventeen stories of skilled labor in science fiction. From the literal guts of a spaceship, to the energy-starved lands of a future Earth, to the inhospitable surfaces of other planets, Menial explores the stories of people who understand and maintain the building blocks of civilization. They work hard, live hard, and love hard. They're not afraid to build the future they want to live in, even knowing the often high human cost of hard labor. 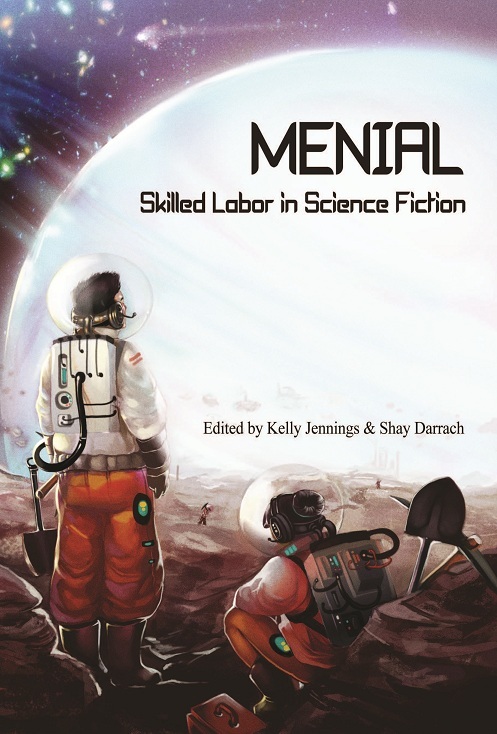 Menial continues Crossed Genres’ commitment to bringing underrepresented voices into fiction, with a mix of new and established writers. Cover art by Jael Bendt. CG’s list of publications includes Sabrina Vourvoulias' Ink; Daniel José Older’s Salsa Nocturna; Kelly Jennings’ Broken Slate; RJ Astruc’s A Festival of Skeletons; as well as the anthologies Subversion, Fat Girl in a Strange Land, and the forthcoming Winterwell. For more information about Menial, or any of Crossed Genres’ titles, contact Bart Leib at 617- 335- 2101 or by sending an email to publicity@crossedgenres.com. This is not to say we have no students who are Leftists. We do, and many of them gravitate to my office, and my classes. But wow, are they in the minority here. And also? The students who tell me, with a self-satisfied smirk, that they aren't going to bother to vote, because it "doesn't matter." Frankly, those are the students that annoy me most. Anyway, I have had more migraines this month than in the past 12 combined, and at this point I will just be glad when it is over. In Nate Silver I trust. But then I'm reality-based that way. (1) Don't. Yes, I know -- someone is wrong on the internet, and you must set them straight. But really, the capacity for people to change their minds based on evidence or logic is greatly overrated, and don't you have a better use for your time? (3) Back up your arguments with citations and with cited facts. Put in links. (5) When you're wrong, admit it. (6) Don't argue about irrelevant things. If it's a minor point, let it go. People can be wrong about the main character in a book, or who wrote what movie. Eh. (7) Don't argue about religion. Don't use religious point when you're arguing. If these folks are part of your religion, they probably already agree with you on whatever point you're making; if they're not, why would they care what your religion says? (8) Beware trolls. Do not feed them! remove, to the six-thousandth power. while other are nailed above the earth. have woken up to what he was doing. one man to save 6,000. We're back from the Arkansas Philological Association conferences, which was held in Hot Springs this year. A nice city to hold a conference in, I must say. It was held at the Arlington Hotel, which my kid (who goes with us to these things now that she is old enough to find the presentations interesting) said reminded her of the hotel in The Shining. It was very like that hotel! Built in 1924, it has the same long corridors, louvered doors on the rooms, and hot spring pools up on its 7th floor, as well as an attached walking trail that goes up into the national forest behind it. The lobby was huge, marble, and very impressive. The conference itself went well -- I read a story, and Dr. Skull his poetry, and we attended several interesting presentations -- but we had more fun, I think, roaming Central Avenue, the street the Arlington is on. Lots of tourist shops, mainly; art galleries and rock shops. You know I love rocks. I got a lovely bit of tourmaline and a fossil ammonite. But now I am exhausted, and I must teach on Monday. I am thinking of showing Hedwig and the Angry Inch to my Queer Lit class -- has anyone seen that? Is it too appalling to show undergrads? I have a copy, loaned to me by a student, but I haven't yet screened it. So if you watched the debate last night, you know there were several bits from Mitt that were jaw-dropping, yell at the TV outrageous -- like when he promised us that no middle-income person would pay taxes on their interest or capital gains. Uh, yeah, Mitt. That's a real problem among us making less than $50,000/year. All that interest we have to pay on our capital gains. But the "binders full of women" bit, ai. Though I suppose it's no shock that someone who thinks the way to handle workplace and pay discrimination against women is to let them go home at quitting time so they can cook for their families would also be a ripe idiot about the problem of women getting paid fairly is noblesse oblige -- yeah, let the rich white guy decide on his own, out of the goodness of his heart, that women (and which women) deserve to be hired. But worse? His whole binder story is another Romney lie. He didn't decide he needed to hire more women. He didn't ask "women's groups" to find qualified women because none had applied for the positions in his cabinet. And -- importantly -- although after he was pressured by the women's groups (who came to him and pointed out the dearth of women in his cabinet), although he did hire a few women (not as many as he claimed to have, last night), he put all those women in positions where they could do almost nothing in his government. This is what you get with the GOP. Soap suds and window dressing and lies, in the place of true justice, or true equality. Here's Dr. Skull's obituary for Spike, published on his FB. ITAR-TASS – 5 October 2012 The Politboro of the People’s Democratic Republic of Burgh today announced with great sorrow the death of Spike, a hero of the PDRB, a winner of the Order of Burgh, and a New Socialist Dog. Spike was born under the remorseless heel of capitalism, abandoned to the depredations of the streets, where he was recruited for the Party. After a period of education, Spike joined the Young Soviet Dogs where he distinguished himself in the Great Patriotic Struggle against the Fascist Cable Installers whose invasions plagues the PDRB in the early days. A remorseless foe of the paper tigers of the US Postal System, Spike also fought the toadies of UPS and their lickspittles Fed-EX with such a vigor and adherence to socialist ideals that he was awarded the Order of Burgh on May Day, the highest honor for a New Socialist Dog. Spike lived a long and fruitful life, finally succumbing to old age. Even at the last, Spike bared his fangs at those who sought deliver Capitalist mail. His motto: Bark, Bark, Bark will be engraved on his tomb in Burgh Square. Those wishing to honor Spike’s memory should report to their local party headquarters where recruiting for the Spike Shock Workers Brigades are forming to implement a five-year plan to increase wheat and steel production in the central provinces. Strange Horizons, one of the best online SF/F magazines, is now having its yearly fund drive. It's a great cause -- throw them some money if you can!